98 Cheap and Easy Foods to Make for Under 5 Bucks! The key to saving money with meals is to look for healthy foods that are versatile and nutritious. Think: peanut butter, oatmeal, canned beans, garbanzo beans, lentils, eggs, almonds, apples, bananas, grapes, fresh or frozen spinach, carrots, kale, canned tomatoes, chicken breasts, broccoli, onions, garlic, brown rice, potatoes, sweet potatoes, nuts, tofu, and milk (almond, soy, rice or cow’s). With these staple items you’ll be able to make so many different, inexpensive meals! 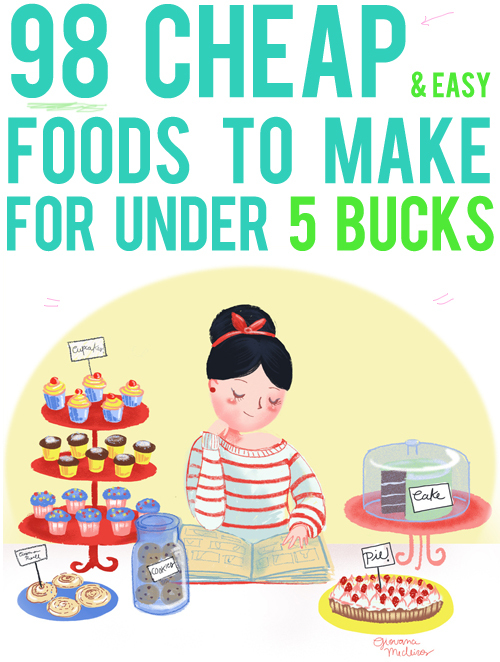 Below you’ll find A TON of cheap and easy foods (and meal ideas) that are all under $5! Whatta’ need? Whatta’ need? Breakfast, lunch, dinner, dessert, or snack ideas? I’ve got you covered! Quick Tip: Making Breakfast for Dinner is always a great money-saver! 6. Crepes!– If you choose sweet or savory you can’t go wrong. These crepes are unbelievably easy to make and, trust me, no special pan is needed. 7. Egg Bake – Blend a dozen eggs with a splash of milk, a handful of cheese and diced peppers (or tomatoes). Pour the mixture into a 13” x 9” pan and bake at 350 degrees until cooked through which will be approximately 30 minutes. 10. Fancy Frittata – 1 potato, 5 eggs, chop any available veggies from your fridge (squash, carrots, squash, kale, green peppers, spinach, etc. ), add 1 diced onion, and a little cheese. Slice the potato into really thin slices and layer them along the bottom of a pie plate that has been rubbed on the bottom and sides with olive oil. Next, layer the veggies on top of the potato slices. Beat the eggs really well and pour on top and sprinkle with cheese (optional). Bake for approximately 30 minutes at 350 degrees. 11. Frozen Banana Smoothie – I used to make these frozen banana smoothies all the time as a kid. It is also a great way to extend the life of your bananas if they are about to go bad. Peel the skin off the banana, wrap in cellophane, freeze, put in blender with 1 1/2 cups of milk (almond, soy, rice, cow’s- they all work the same), add a teaspoon of vanilla and blend until smooth. Add more milk to change the consistency based on your preferences. 12. Fun Fruit Salad – Slice strawberries, apples, blueberries (and any other on-sale fruits), and stir together for an easy and fresh meal. Quick tip: avoid bananas since they go brown quickly and they also get slimy. 13. Oatmeal Muffins– Super versatile. Can’t go wrong with these bad boys. 16. Scrambled Tofu with Buttered Toast – Drain extra firm tofu, break apart with the end of a spatula, add 2 teaspoons of turmeric, and salt and pepper to taste. Stir frequently until browned. 17. Smoothies– And more great smoothie recipes. 18. Spinach and Feta Cheese Omelette – Mix 3 eggs well with a splash of milk and a handful of well-washed spinach, pour into a lightly buttered pan, cook well, and fold in a 2 tablespoons of feta cheese. 21. Hummus and Vegetables – Store-brand hummus or homemade with sliced carrots, celery, broccoli, and or pita bread. 22. Nachos – Layer store-brand corn tortilla chips onto a microwave plate, sprinkle with cheddar cheese, heat in microwave until cheese is melted. 34. Easy-Peasy Baked Potatoes – Use the tines of a fork to create the zig-zag pattern down the center of the potato then squeeze the ends towards the center so the center busts out. Microwave for 8 minutes. Let cool and top with sour cream, cheese, broccoli, or whatever your heart desires. 37. Goulash – 2 cups of cooked elbow noodles, 2 cans of tomato soup,1 pound or less of hamburger (or faux-meat crumbles), and a squirt of ketchup. Cook noodles, brown hamburger, drain noodles, mix everything together and simmer in pan for 5-10 min. 38. Good ol’ Rice and Beans – Black beans cooked with garlic, cumin and a bit of salt spooned over rice. If you have cheese, salsa, cilantro or lime handy add for tastiness. 40. Grilled Peanut Butter and Banana Sandwich – Make your peanut butter and jelly sandwich like usual then butter the bread and grill in pan until the peanut butter gets gooey and delicious. 47. Peanut Butter and Jelly Sandwich – Classic. 49. Pesto, Pear, and Swiss Sandwich on Wheat Toast – Toast your bread, spread a layer of pesto on each side, then pile sliced pear and swiss in the center. 51. Poor Man’s (or Woman’s ;) Soup – 1 large baking potato (or a few small red ones) cut into bite-size pieces, 1 or 2 cans of mushroom soup, add 1 or 2 cans of water, 1 can of carrots, 1 can of peas, 1 can of corn, 1 can of green beans, salt, pepper and hot sauce to taste. Cook on high for 3 hours in crock pot or until potatoes are done. 53. Pretty Perfect Pasta – Whatever whole-wheat pasta in on sale, diced tomatoes, garlic, basil, olive oil, feta cheese and salt. 55. Ramen with Veggies – Toss the salty packet of doom straight into the trash. 57. Rice, Black Beans, and Avocado – Simple. A scoop of beans, a scoop, or rice, sliced avocado and serve with a pan-warmed tortilla on the side. 59. Sliced-Bread Pizza – Put a couple of pieces of sliced bread onto an un-greased baking sheet, layer with marinara sauce, cheese and any vegetables from your fridge. If you have a broiler broil until the cheese melts (a few minutes at 350 degrees). Baking is fine too if you don’t have a broiler. It will cook quickly so keep a good eye on it. 62. Spicy-Peanut Noodles– Add hot sauce to taste. 64. Tuna Salad in Pita or Wrap – 2 cans tuna in water, drained, 1/4 cup mayonnaise, mixed with a bit of garlic. If you like a little crunch, chop celery and include. 66. Vegetarian Lime and Cilantro Chili– Add lime and cilantro to taste. 67. Vegetarian Fried Rice – Cook rice, oil pan, add chopped or frozen veggies (whatever is on sale), mix with rice, and add soy sauce to taste. 74. Matzo Ball Soup– Great for when you’re sick or need to be warmed up! 75. Miso Soup – Use whatever vegetables you have in your fridge: carrots, peppers, onions, zucchini, potatoes, sweet potatoes, tofu, squash, even pumpkin! 90. Orange Julius– I made this all the time as a kid. It’s the perfect thing to make if you’re in the mood for something sweet, cold, and packed full of sugar. Hopefully this list will be a list you can refer to when you are stuck for something easy, and healthy (desserts don’t count;) to make! What are your cheap and easy go-to recipes? Oops! I’ll get that fixed. Sorry ’bout that! This has been my favorite post of the week so far! I loveeeeeeeee this and will be using it all the time! Thank you so much for including your mango lassi in your list of inexpensive meals. I am going to check out more of these ideas bc I can always use more cheap meal ideas to feed our hungry clan. Love the idea for the easy “fancy frittata” – lining the pan with potatoes instead of grating them. It has a LOT of recipes for meals under $2, and they’re all healthy and tasty as well! Very handy post, I’ve just started meal planning as part of the spending fast (mine commences 21 Jan Argh!) & will certainly be adding a few of these dishes. Thanks Anna! Great list! You have “cereal” but I’d add oatmeal, specifically. I have a target to make oatmeal (plain oats bought in bulk) 2x week, much less than a box of cereal per serving. My favorite under $5 dinner is “Pasta with Baby Red Lentils and Ginger”. I want get too spammy and link to my recipe, but I did just tweet a link via @cookingchat if you’re inerested. Hi David, I love oatmeal too! It’s so versatile and can be done up so many different ways. Also, the Pasta with Baby Red Lentils sounds really tasty. Someone posted this link on Pinterest, and I followed it, but very warily. But your ideas are really useful, not all based on convenience foods, or high fat & sugar. I really appreciate your thoughtful ideas! I found this article randomly while searching for meal planning. Its great! Then I noticed it was written by you and I work for Kelly at Scout! Woah! small world!!!! Instant Noodles is one of the under $5 isn’t it? My FIL gave us this one that my daughters absolutely love. They’re called amigas, and they are super simple. The corn tortillas are really cheap. I buy a big stack of them for a buck or two. Heat up a frying pan with a little oil in medium heat, enough oil to coat some corn tortillas. Cut the corn tortillas into strips… We make them about an inch wide and maybe an inch and a half long. Toss them in the pan once the oil is heating and warm them up until they’re soft and pliable. Beat a few eggs in a cup or bowl and then pour them over the tortillas. You want enough to coat the tortillas. Fry them up the way you’d fry scrambled eggs, add some salt and pepper and you’re done. We occasionally put a little cheese on ours. 1 can tuna, 1/2 pkg elbow macaroni, 1/2 cup mayonnaise or miracle whip, 3 pickles or 2 slices celery diced well. cook macaroni, cool, add tuna (drained) and mayo and celery or pickles (diced). Put in fridge to cool then its ready to eat. Thanks! I’ll have to give this a try. Sounds like a good summer lunch option. What I like is lentil sprouts that are no more than an inch long – about 2 cups put into blender. Add 3 eggs and blend. I make them up like pancakes. They are totally delicious. Lentil sprouts are I easy to grow. Might have to adjust the amount of sprouts to egg. I can have guacamole any time of the day! Thank you for all of the meal ideas! One problem: how do I subscribe to your site? B. My Hubby used to love my rice, bacon and sauerkraut dish. So easy to make cook rice, ( at least 1 cup dry), chop up 1 lb of bacon to bite size pieces and cook in fry pan ( save the fat with the bacon). 32 oz jar of sauerkraut. I buy my bacon when it is on sale or I can buy the ends for cheap. I make easy sauerkraut ( off the net) with cabbage when I’m given it or it is at it’s cheapest. I use quart jars to make it. And rice is a staple that is bought near Chinese New Years as that is the time of year it seems to be the cheapest around here. If you have a larger family just double the amounts. uh NUTS are NOT cheap!! Sounds great! I’ll definitely try some of the recipes on the list soon. Thanks for sharing! Awesome Post, Anna. I really liked the recipe of No bake cookies, I am a sucker for easy to prepare food. Awesome list. Will definitely share on my Facebook page for my followers. Thanks for putting this together. My cheap fav is a corn tortilla (already fried) topped with refried beans, lettuce, tomato, cheese, and sometimes bell pepper. And the good news is you can eat two of them for around 300 calories which doesn’t hurt either!